of the air cleaner. AutoPamic® models can be upgraded to include a gravity-discharged dust pre-cleaner. RotoPamic® models are upgradable to either a compressed air or exhaust-aspirated pre-cleaner. An optional, easy-to-use service indicator tells when to change the filter element assuring maximum usage and lowest operating filter costs. 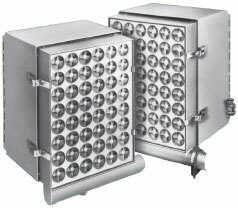 With its low intake air restriction and its greater effective media area than other dry-type air cleaners, the Pamic Series offers improved fuel economy and lowers per hour operating costs. No special tools or techniques, dirt is held inside the pleated filter element tubes. The filter is replaced from the dirty side of the air cleaner, reducing the danger of engine contamination. Because it is an integral part of the filter element, there are no separate gaskets to replace.